These days are lazy. As the weather has warmed, my appetite for — and desire to cook — heavy, bready things has waned. Gone are the consistent cravings for bagels every other day. Many weekends, I don’t even want pancakes. Blasphemy! I’ve been beginning most of my days lately with yogurt, fruit, and granola, and then often have a second breakfast at lunchtime with avocado toast topped with a fried egg. Really, most of what I want these days includes protein and fruits and vegetables. But that doesn’t mean that I don’t still crave some luxury on a Sunday morning. I just want it to include less flour, more eggs, and be topped with yogurt and fresh fruit. 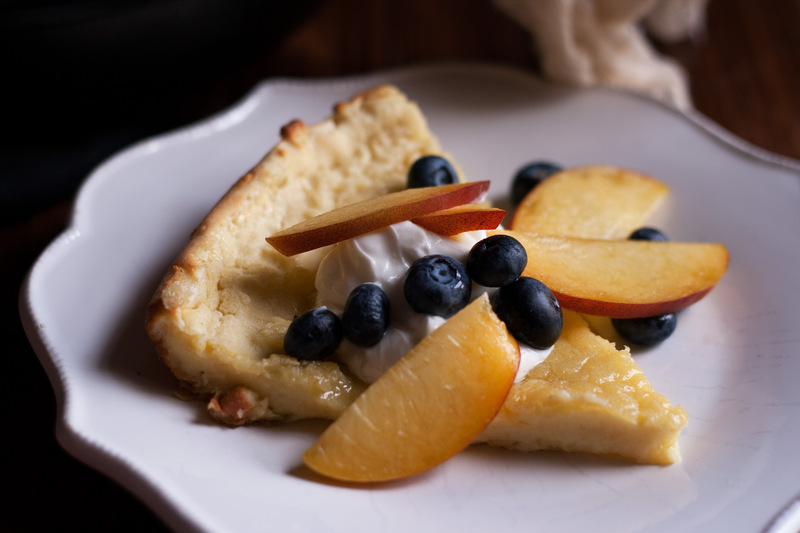 Thank goodness for the FauxMartha’s Blender Dutch Baby, because now it’s all I want to make to sate my weekend morning sweet tooth. 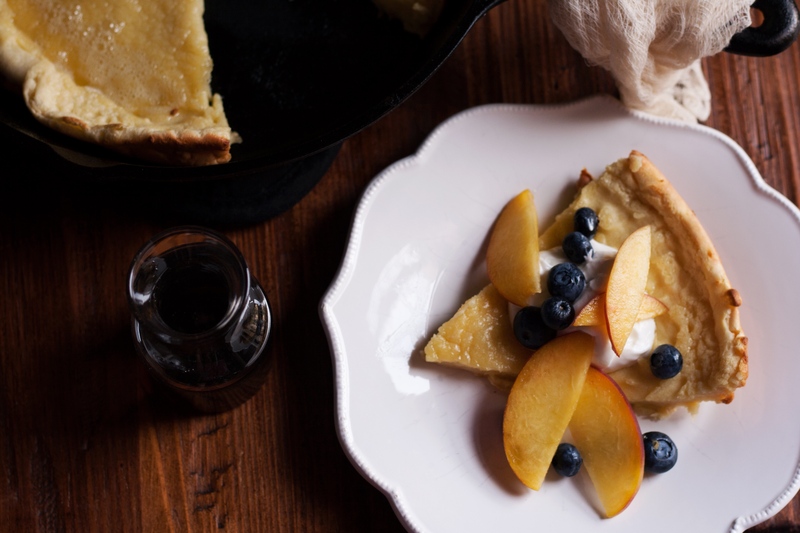 “What is a Dutch baby?” you may have asked anytime in the last couple of years while this tasty breakfast was gaining steam — literally. 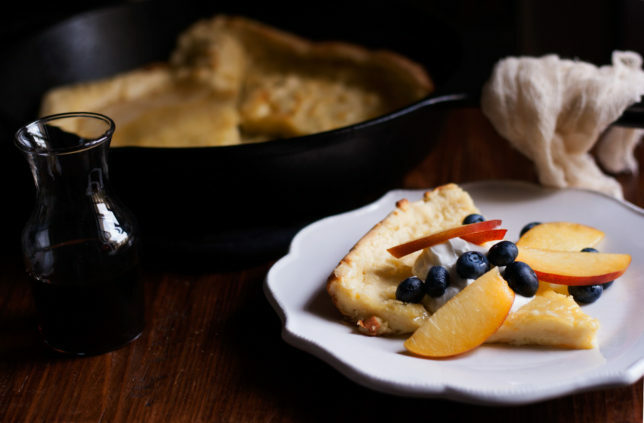 It’s a kind of giant pancake, really, whose lift comes from eggs and a hot skillet rather than any baking powder, soda, or yeast — sort of like a popover. 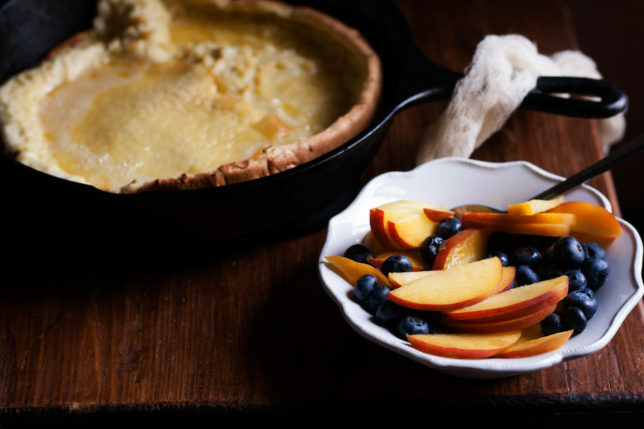 It rises in the oven, crumpling and folding over itself as it pushes hot, shimmering butter around itself, and falls as it cools, resulting in a custardy, silken sheet. 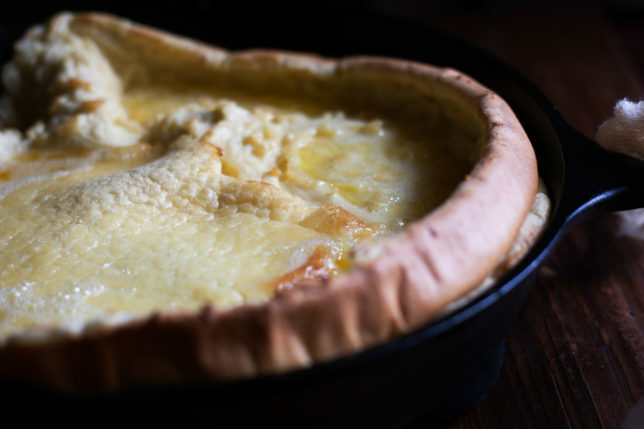 Dutch babies come together in minutes in the blender (or food processor, if, like us, yours has broken), while your oven-safe skillet preheats, a block of butter at its center melting and sizzling as it awaits the frothy, vanilla-tinged batter. This leaves you time to then make your coffee, rinse and maybe slice your fruit, and fry your bacon, all while your dutch baby rises and crumples in the oven. 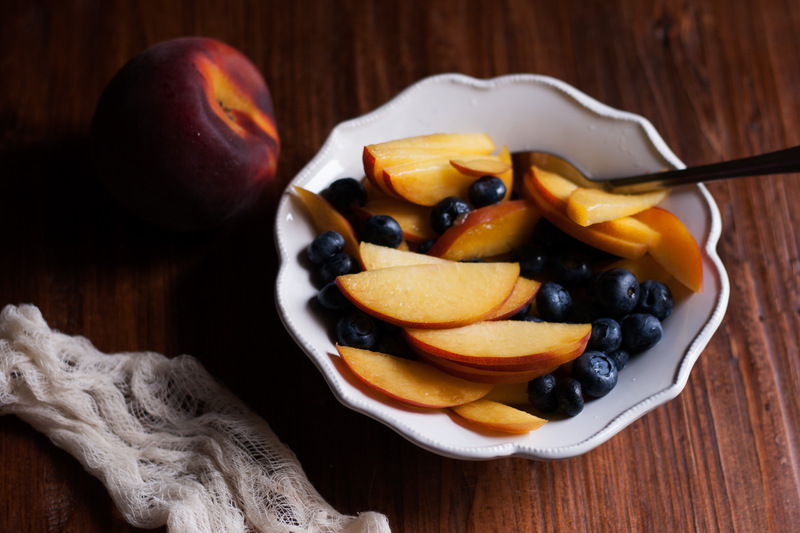 We’ve been loving ours with Greek yogurt or Icelandic skyr, berries and peaches, and a drizzle of pure maple syrup. Along with a side of possibly the best bacon we’ve ever eaten, sold by the pound at Astoria Bier and Cheese, on special occasions. 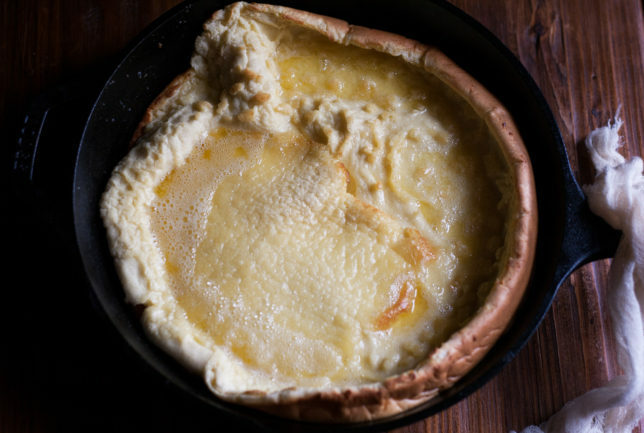 I finish my Dutch baby breakfasts feeling neither a little hungry, nor too full. It’s become part of our weekend routine, perfect in its ease, delightfully delicate in taste. I even made this after I came home from a hot, sweaty race a couple of weeks ago — it’s that easy, requires that little effort, and is that good. You guys! I’m on Snapchat. I must be old because I’m still kind of getting the hang of it and it feels a little self-indulgent. I mostly make funny faces and take pictures of my cats, but hey, that’s life, right? Let’s be friends! I’ve made this recipe with both granulated sugar and turbinado, because for a while I wasn’t quite sure what “pure cane” meant. Did it need to be raw? Both work, but perhaps because we’ve never owned the best blender I found a lot of the turbinado got left behind, caking a bit to the blades. My vote is for granulated — but I’m with her that you should seek out the kind that’s pure cane (most are, I think). I mean, what the heck is beet sugar and why would anyone want to eat it?? Preheat the oven to 425 degrees with a rack in the center. Place butter in a 10-inch cast iron or other heavy, ovenproof skillet and allow it to melt in the oven while it’s preheating. Once the oven is preheated and the butter is melted and bubbling, remove the skillet, pour in the batter, and return to the oven. Bake for 15 minutes, or until golden, puffed, and crumpled. Remove, cut into wedges, garnish with Greek yogurt, fruit, pure maple syrup, or whatever your heart desires.